The CDT is no country for white blazers, but let me first explain what I mean by white blazer. No, I don’t mean one of those Don Johnson, old-school Miami Vice dinner jackets. A white blazer is an Appalachian Trail hiker who adheres to the official, white-blazed trail and does not take alternate routes that skirt the AT. If a white blazer departs from the official AT for any reason, he or she will return back to the point of departure before hiking on so as not to miss any of the official route. White blazing is a way of life for many AT thru-hikers. When I thru-hiked the AT last year, I, myself, was a white blazer. I made sure I hiked every mile of the AT, no matter what. It was important to me for my hike, but I didn’t care what other people did. Hike your own hike, right? I didn’t even really like talking about my white blazing. It made me feel neurotic, like telling people that I have to dry off each foot in a particular pattern when I get out of the shower. Which of course isn’t true. White blazes abound on the AT. I hear that trail markings on the CDT like to play hide and seek. On the AT, it is pretty easy to white blaze. There aren’t really any recognized alternate routes. Sure, there are some scenic loops that connect back with the AT and some side trails, but otherwise, the trail is incredibly straightforward. The Continental Divide Trail is different. White blazing, as a concept, doesn’t work. If the two trails were books, the AT would be a John Grisham thriller with a few plot twists, but largely straightforward. The CDT would be an obscure work of James Joyce, where you’re never really sure you’ve peeled back all of the layers. When I started planning my thru-hike, I had every intention of only hiking the official CDT. When I started looking at maps, however, I broke out into a sweat. Instead of one continuous line running north to south, there were lines all over the place of various colors and lengths. There were even two starting points at the Mexican border! Complicating matters further were the different map options to choose from. 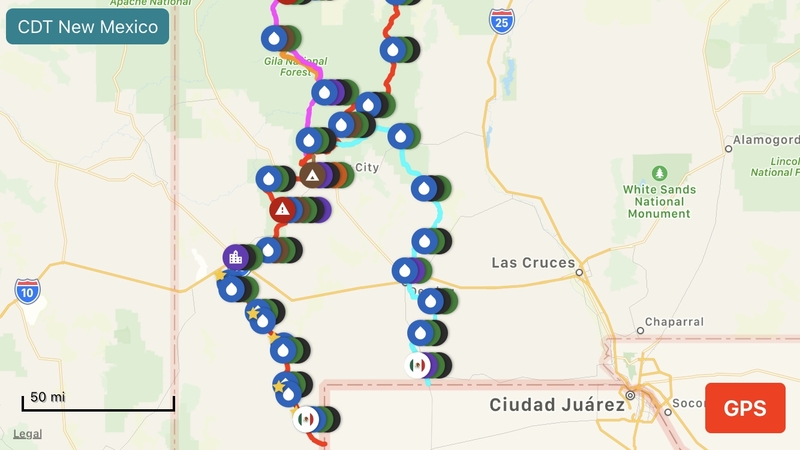 In addition to the popular Guthook app, hikers can also select from the Jonathan Ley maps, the Bear Creek maps, and now the Continental Divide Trail Coalition’s (CDTC) maps. Not all of the routes are on all of the maps, and not all of the maps are in agreement on the official trail route. Starting to get the picture? Here Guthook shows the two Southern Termini of the CDT, the “official” trail in red, and alternates marked with other colors. Of course, not quite getting it yet, my white-blazing mind set about trying to nail down which route was the definitive, official CDT. This wasn’t too hard to do if I accepted it as the route defined by the CDTC. OK, great. I then assumed I would just follow that official route north, taking alternates for fire closures as required only. Sounds good, right? Not really. You see, the more I dug into it, the more I realized that the other routes on the CDT, the routes people refer to as alternates, are not just there to get you around fires or shave mileage. Many are alternate routes that offer their own unique trail experiences. In fact, some of the alternate routes have become more popular than the actual “official” CDT. The Gila River alternate in New Mexico is a great example of this. According to Halfway Anywhere’s 2018 CDT Thru-Hiker Survey, 95% of thru-hikers last year took this alternate, known for its river crossings, canyons, and hot springs. There is hope for white blazers coming to grips with the complexities of the CDT. As I studied the various alternatives, I started to recognize the adventure in being able to pick my own route. It was hard to shake off that white-blazing mind-set I had on the AT, but once I did, I didn’t look back. I do want to hike some of the alternates and I also know that Mother Nature is going to make some of those decisions for me. I decided that “continuous footsteps from Mexico to Canada” would be my goal, but alternates will definitely be fair game. It was a mental compromise, I guess, and allowed me the freedom to loosen the reins and explore all of the wonderful scenery the CDT has to offer. 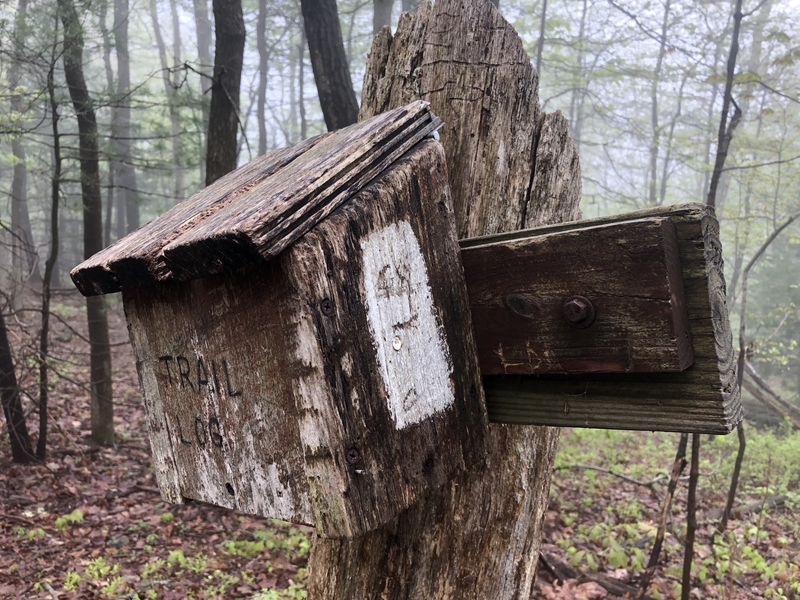 For additional information on CDT alternates, check out Effie Drew’s article here on The Trek, “The Basics of planning a CDT Thru-Hike.” She shares a wealth of knowledge as someone who has thru-hiked the CDT and I found it very helpful for my own planning. Hike your own hike, and hike on. My name is Kevin, but you can call me by my trail name, Hungry Cat. I thru-hiked the Appalachian Trail in 2018 and, like Britney, oops I'm doing it again with the CDT this year. Amongst other things, I keep a blog at unfetteredfootsteps.com because I like writing and making videos about travel and hiking. I consider myself well versed in getting lost, eating food buried in dirt on the trail, and in playing out mid-life-crises across multiple countries. In addition to hiking, I like to travel off the beaten path and just recently returned from trips to Vietnam, Cambodia, and New Zealand. Life is for adventuring! Awesome article! Thanks for sharing. I would probably have had a hard time with this too, but I like your thoughts on continuous footsteps from Mexico to Canada. I feel like this article is going to help a lot of people go through the emotions and struggles you did with accepting this and making your own decision a lot faster and less painful/stressful.